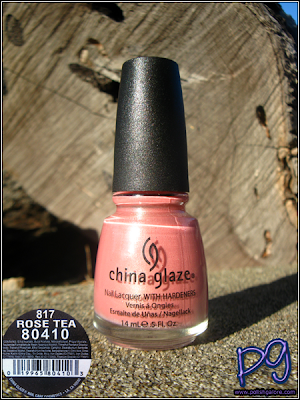 When Rose Tea came out in the Specialty Collection, I was obsessed. It's a medium pink with a light green shimmer. While the shimmer is no where near as apparent in photos, it's what made this color pop for me. I used a base coat of Zoya Get Even, 2 coats of polish and a top of Seche Vite. The formula on this polish is super smooth, awesome, beautiful. Sun! Geez, I love this color - but like I said, it's hard to see that green shimmer. Still lovely. Shade is more true to the pink color BUT again, where is that shimmer? You can see it a tiny bit in the bottle, but man, y'all are missing OUT! Finally indoors with the flash - and just a bit of the shimmer is showing! Love love love. So dipping into my vault... back when I was just using a web camera and a natural 6500K light bulb... Don't laugh too much. Great color! Haha your webcam photos actually turned out pretty good!! Gorg. The opacity of China Glaze's pinks never ceases to amaze me.